Step 2: create a FastAPI "instance"
Copy that to a file main.py. main: the file main.py (the Python "module"). app: the object created inside of main.py with the line app = FastAPI(). --reload: make the server restart after code changes. Only use for development. INFO: Waiting for application startup. That last line shows the URL where your app is being served, in your local machine. Open your browser at http://127.0.0.1:8000. And now, go to http://127.0.0.1:8000/redoc. 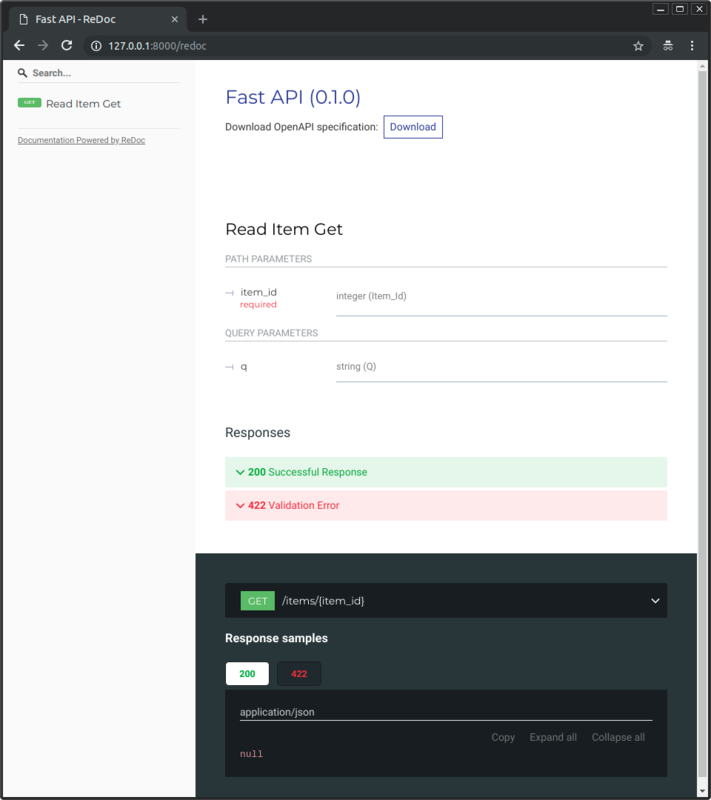 FastAPI generates a "schema" with all your API using the OpenAPI standard for defining APIs. A "schema" is a definition or description of something. Not the code that implements it, but just the abstract description. In this case, OpenAPI is a specification that dictates how to define a schema of your API. This OpenAPI schema would include your API paths, the possible parameters they take, etc. The term "schema" might also refer to the shape of some data, like a JSON content. In that case, it would mean the JSON attributes, and data types they have, etc. OpenAPI defines an API schema for your API. And that schema includes definitions (or "schemas") of the data sent and received by your API using JSON Schema, the standard for JSON data schemas. If you are curious about how the raw OpenAPI schema looks like, it is just an automatically generated JSON with the descriptions of all your API. You can see it directly at: http://127.0.0.1:8000/openapi.json. This OpenAPI schema is what powers the 2 interactive documentation systems included. And there are dozens of alternatives, all based on OpenAPI. You could easily add any of those alternatives to your application built with FastAPI. You could also use it to generate code automatically, for clients that communicate with your API. For example, frontend, mobile or IoT applications. 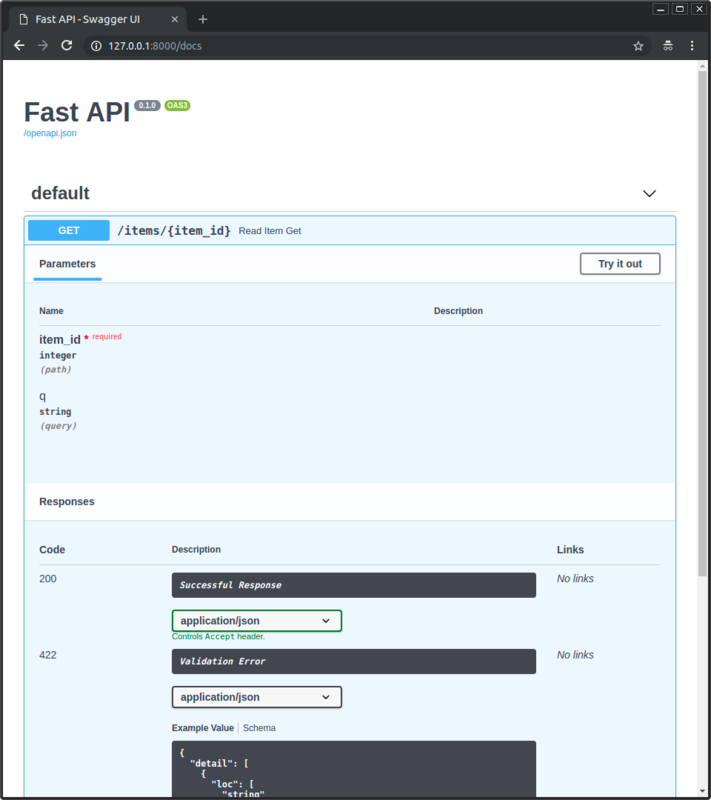 FastAPI is a Python class that provides all the functionality for your API. FastAPI is a class that inherits directly from Starlette. You can use all the Starlette functionality with FastAPI too. Here the app variable will be an "instance" of the class FastAPI. This will be the main point of interaction to create all your API. "Path" here refers to the last part of the URL starting from the first /. A "path" is also commonly called an "endpoint" or a "route". Building an API, the "path" is the main way to separate "concerns" and "resources". "Operation" here refers to one of the HTTP "methods". In the HTTP protocol, you can communicate to each path using one (or more) of these "methods". When building APIs, you normally use these specific HTTP methods to perform a specific action. So, in OpenAPI, each of the HTTP methods is called an "operation". We are going to call them "operations" too. That @something syntax in Python is called a "decorator". You put it on top of a function. Like a pretty decorative hat (I guess that's where the term came from). A "decorator" takes the function below and does something with it. In our case, this decorator tells FastAPI that the function below corresponds to the path / with an operation get. It is the "path operation decorator". You are free to use each operation (HTTP method) as you wish. FastAPI doesn't enforce any specific meaning. The information here is presented as a guideline, not a requirement. For example, when using GraphQL you normally perform all the actions using only post. function: is the function below the "decorator" (below @app.get("/")). This is a Python function. It will be called by FastAPI whenever it receives a request to the URL "/" using GET. In this case, it is an async function. If you don't know the difference, check the "In a hurry?" section about async and await in the docs. You can return a dict, list, singular values as str, int, etc. You can also return Pydantic models (you'll see more about that later). There are many other objects and models that will be automatically converted to JSON (including ORMs, etc). Try using your favorite ones, it's highly probable that they are already supported. Write a path operation decorator (like @app.get("/")). Write a path operation function (like def root(): ... above). Run the development server (like uvicorn main:app --reload).